Oracle Property Manager provides an effective tool to manage major real estate tasks, including lease administration and office space allocation. It also produces reports in a variety of formats that present records, depending upon the business needs. 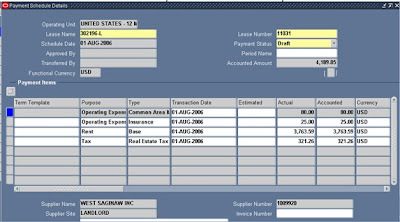 It is integrated with other Oracle applications like Payables and billings generated can be exported in Payables Application. 3. 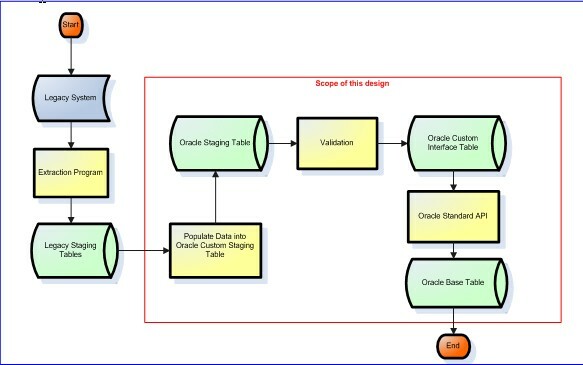 Insertion of Data into Oracle tables using Standard Insert Packages. The conversion was carried out for creation of Prime and Sub leases with lease status as ‘Active’ and approval status as ‘Final’. Also it was required to generate the Payment Schedule and Items for the leases. Different Programs with similar conversion approach were used for conversion of Sublease and Prime Leases as different details were required to be populated. Following is the detailed approach for the Property Manager Conversion. 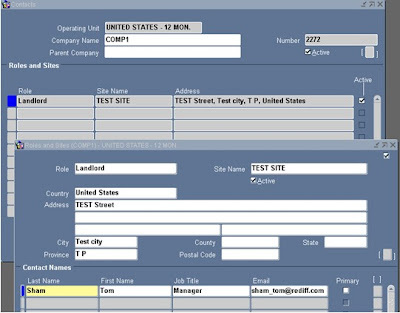 a) Header staging table: Data for creating Lease Header and Lease Details was stored in this table. b) Payments staging table: Data for creating Payments/Billings was stored in this table. The Payments/Billings account Distribution and Payments Milestones was also created using the data from this table. c) Other Charges staging table: The Data for creating other charges payment streams along with the account Distribution was stored in this table. d) Comments staging table: Data for Lease notes Creation. e) Options staging table: Data for Creation of Renewal and Original terms Option along with Options Milestones. Once the Data was inserted into the Staging tables the process status was updated to ‘1’. Various validations such as Business specific validations, Mandatory values, etc... were performed on the Data. For validation only those Header records and corresponding Payments, Milestones, Options and Notes records which have error flag as ‘N’ were picked and processed. Then the next header and corresponding records from other staging tables were picked and validated. If the record is validated successfully the process status was updated to ‘2’. Incase the record failed validation the process status was updated to ‘2’, also the error flag and error description columns for the record were updated for the specific validation failure Message. Those Lease header records which are validated successfully were picked for further processing. 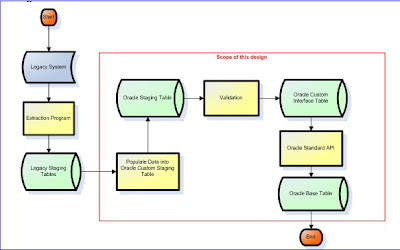 Corresponding to Header record, Payments, Milestones, Options and Notes records which have error flag as ‘N’ were picked and using the Standard Insert Packages the data was inserted into the Oracle Base tables. Incase of any errors the insertion for that particular Lease record was roll back and then record was updated as process status ‘3’ along with error flag and error description. 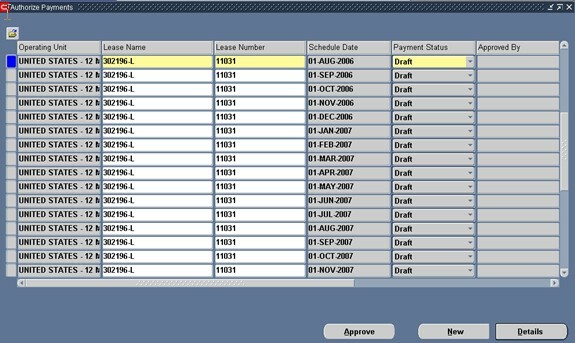 For all successfully inserted records the process status was updates as ‘4’. Once the Lease record was created successfully the ‘Schedules and Items’ program was submitted with lease context as 'ABS' to finalize the Lease. This Program finalizes the Lease and creates the Payment Schedules and items for that lease. According to the Specific Business requirement various custom lookup code and meaning should be defined in the Standard Lookups. Lookup code for Milestones type is defined in this lookup. This lookup stores the Option types that can be created for the Lease. This lookup store the different Note types that can be created for the Lease. Define any custom Payment types in this Lookup. Define any custom Payment term types in this Lookup. This Lookup is used to define any custom Usage type for the Locations in the Lease. Define any custom Right types that will be created for the Leases. 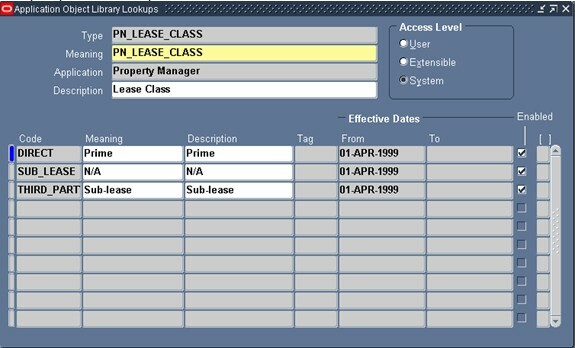 Locations for which lease is to be created needs to be defined in this screen. The name of Location was defined as Profit center number (Store Number) for the store and class of Location was defined as ‘Store’. The Tenure needs to be defined as ‘Leased’. Address of the Store was defined as the address of the Location. The Start and End date of the locations defines the period for which the location will be occupied during the lease agreement. 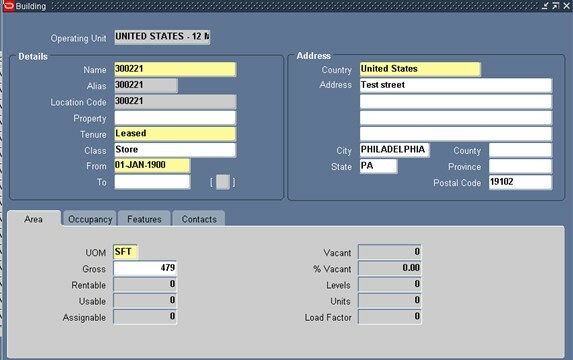 The Contacts for each company was defined in this screen. A single company can have number of roles and each role can have different contact person all these data can be entered here. The details such as Contact Roles, Site address, Telephone number and Contact names were defined. Standard Insert packages were used for the conversion. The details of the API’S used are given below in the sequence which they were used in the Conversion Program. This API creates the Lease Header and Details. This API returns the Lease Id, Lease details Id and Lease change Id as the output parameters. This API populates the Location Details for the Lease. This Location was created for the Profit Center (Store) which is defined as Location in PN_LOCATIONS. This API returns tenancy id for the location. This API’s was used to create the various Options such as Renewal, Original terms for the Lease. This API returns the Option id and Option Number for the lease. 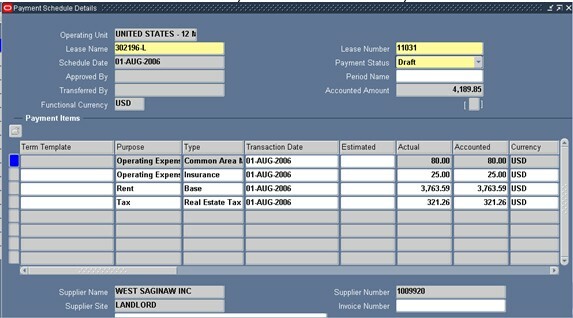 This API’s was used to create the type of Rights such as Buyout, Purchase, etc... for the Lease. This API returns the Right Id and Right Number for the Lease. This API returns the Contact assignment Id for the Lease as output parameter. This API’s was used to create the Billing streams for Sublease and Payment streams for Prime Lease. In order to create the Account Distribution for the Payment stream pn_distributions_pkg.insert_row was used. First payment streams were created for each lease by calling the Payments API. Then the Account distribution was created for the Payment stream calling the Distribution API for each account entry. Payment streams were created for Regular and Other Charges Payments. This API returns the Payment term Id which will be used for creating the Account Distribution and Milestones for the Payments. Call this API with different Account Classes for a Payment stream in order to create multiple Account distribution. that part of the lease. For example: to create the Milestone for Payment Stream pass the value of the parameter payment_term_id and pass the ‘NULL’ to Option id and Insurance requirement id. b. Create Entries into Payment Items Table(PN_PAYMENT_ITEMS)for each Payment Schedule. c. Finalize the Lease. The Program will finalize the Lease if the Lease context is passed as ‘ABS’. by passing different Lease Context. Click on Details tab to check the Payment Items for each Payment Schedule. 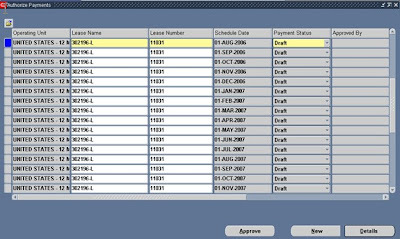 This Payment Schedule can be approved and then exported to the Oracle Payables by using the Export to Payables in the same menu option. Its awesome , Thanks a bunch ! Thanks for the wonderful post..
Can you please help me out in finding how the calculation of rent will done for normalized leases..especially in accounts distribution tab.. I need to know, from where 'location_code' and 'Location Alias' in building form is being populated? what i know is: we have to give all the details related to site (Address, Date, UOM etc. ), while saving the form, 'location_code' and 'Location Alias' is getting populated/generated in a sequence manner. Just need to know where the code is defined for the sequence.